When it comes to saving some money on our projects, it can always be appreciated. Quilting fabric does not come cheap! For all those quilters who are on a tighter budget, this one is for you! 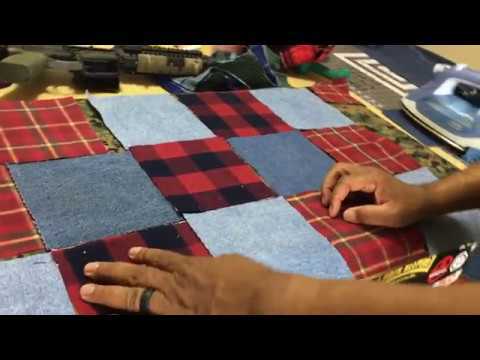 Brought to us today is a great tutorial by The Quilting Marine, and he is giving advice on how to make what he calls “the tough guy quilt”. The quilt itself is super attractive, but the coolest thing about the quilt is the fabric that he chooses to use in it. He chooses to go to thrift stores and gather old clothes to make a quilt out of. He chose to do a sort of flannel and denim combination that adds a masculine look. And that also can make it a great gift for anyone who may not like the usual patterns and colors that quilting fabric often comes in. Not only that, but the choice of fabric also saves a lot of money. We found that the theme of the quilt is unique and there are a lot of things that we can do with it. You could also make it out of clothing from a loved one and make it a really personalized gift. We will need some of our basic supplies, like our scissors and rule, to complete this tutorial. He takes us through how to cut the denim and get the most out of it. There is also a great tip on how to get our flannel material to be a little sturdier. The quilting marine really puts together a great tutorial on the tough guy quilt and it was entertaining as well! He jumps right into the project and it’s definitely beginner friendly so don’t be afraid to try it out. Check out the video below and have a great time with this unique, money saving quilt project! To see his tutorial on creating the blocks, click here.